Long-term observation of cell behavior at the single cell level is a crucial prerequisite for understanding molecular cell fate control. This is of particular importance when analyzing highly dynamic and heterogeneous developmental and stem cell systems. The required observations are possible by time-lapse microscopy, but reliable identification of specific cell types and maturation stages usually requires detection of molecular marker expression. However, only few of the necessary cell or animal lines expressing genetically encoded fluorescent markers exist, and the generation of novel reporter lines is laborious and slow. Here, we describe long-term antibody staining in living cell cultures as an easy, robust, flexible and fast way of continuous real-time marker detection on living cells. This approach greatly simplifies the live identification of specific cell types in heterogeneous and dynamic culture systems. Continuous long-term observation of individual living cells is an essential prerequisite for understanding complex and dynamic cell systems (1,2). Fluorescent time-lapse microscopy allows single cell observations in vitro even over weeks (3-5). However, live identification of specific cell types and maturation stages remains difficult because only few cell types can reliably be recognized by cell morphology and size. Detection of stage specific molecular markers in living cells is therefore necessary for cell type identification. This can be achieved by using transgenic cell or animal lines expressing genetically encoded reporters like fluorescent proteins (FPs) at specific maturation stages (6). However, the generation and validation of novel reporter lines is laborious and slow. In addition, the ‘color’ of an existing reporter line can only be changed by again re-generating a validated line with a new reporter. Together with the limited availability of bright FPs with non-overlapping spectral properties (2), combinatorial possibilities of different reporter lines remain restricted. In reality, most existing reporter lines only express green fluorescent protein, making it impossible to combine even only two of these lines. Detection of surface molecules on living cells by antibodies (ABs) is another versatile method of cell type identification. It is routinely used in fluorescence activated cell sorting (FACS), but also for visualization of cellular surface markers in vivo (7). Here, we point out that AB staining of living cells is an extremely useful, fast and easy approach also for long-term real-time detection of molecules on living cells. It can be used to detect the dynamic up- or down-regulation of surface markers in cell cultures for up to weeks (4). For most ABs of different species and isotypes, this simply requires adding them to the culture medium once at the start of the experiment in the right concentration (Table 1). Fluorescent background signals of the AB containing medium are low or undetectable, and upon enrichment of the ABs on the cells’ surface within minutes to hours, strong fluorescent signals can easily be detected. Most tested ABs bind all and only cells expressing the correct target epitope. ABs are stable over weeks at 37°C – even in dense cultures of many different cell types, e.g. of differentiating stem cells on confluent feeder layers (4). We have successfully detected specific AB staining on many different types of both adherent and non-adherent cell types, for example different stages of embryonic and adult hematopoietic, endothelial and neural progenitor maturation (Table 1). Staining of cells under layers of other cells (4) and in semi-solid medium is also possible. In conclusion, long-term live detection of surface molecules by ABs is a powerful and versatile method for identifying specific cell types in complex living cell cultures in real time. ABs recognizing stage specific surface antigens have been generated for most tissues. They can be ordered with direct conjugation to fluorophores, or can be labeled by commercially available robust kits. The wide variety of available non-protein fluorophores with optimized fluorescent properties (2) allows simultaneous use of multiple ABs and simple adaption of staining strategies to existing reporter lines. We have successfully used ABs labeled with e.g. FITC, PE, APC, Alexa and DyLight fluorophores. Add the right concentration of ABs to the culture medium once at the start of the experiment (Table 1). Many commercial ABs are sold in solutions containing azide, which can be toxic to cells even at low concentrations. It is usually crucial to buy azide-free AB solutions, or to remove the azide e.g. by dialysis. Control experiments should be performed to test if the AB binds the correct molecules under the used conditions. 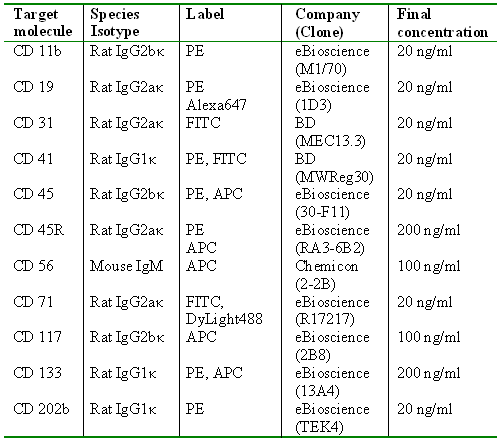 Experiments with cells that do or do not express the epitope to be detected, as well as with isotype control ABs, allow testing if the AB binds to all and only the correct cells. In addition, cells can be analyzed after “in culture live staining” by subsequently co-staining them with ABs against the same molecule labeled with a different fluorophore and analysis by e.g. FACS. When using an AB against a different epitope of the same antigen, all and only cells stained by in culture AB binding should also be bound by the second AB. Alternatively, when using an AB against the same epitope (e.g. the same AB clone labeled in a different color), binding of the second AB should be decreased or inhibited by the first AB already bound during culture (Figure 1). It is important to keep in mind that some ABs can inhibit or activate functions of their target molecules8 and could influence the behavior of the cells to be stained. Control cultures without ABs should always be observed in parallel to exclude possible effects of the ABs on the analyzed biological system. Cells can take up bound ABs via receptor-mediated endocytosis, possibly leading to long lasting labeling of endocytotic vesicles. Although this can improve detection of cells expressing an antigen by continuous increase of an otherwise low signal, it can also prevent the detection of surface molecule down-regulation. In this case, labeling of ABs with pH sensitive dyes like FITC will lead to loss of fluorescence upon internalization into vesicles with low pH and allow visualization of only freshly bound epitopes on the cells’ surface. T. Schroeder, Ann N Y Acad Sci 1044, 201 (2005). T. Schroeder, Nature 453 (7193), 345 (2008). M. R. Costa, G. Wen, A. Lepier et al., Development 135 (1), 11 (2008). H. M. Eilken, S. Nishikawa, and T. Schroeder, Nature 457 (7231), 896 (2009). M. A. Rieger, P. S. Hoppe, B. M. Smejkal et al., Science 325 (5937), 217 (2009). S. Heck, O. Ermakova, H. Iwasaki et al., Blood 101 (3), 903 (2003). D. A. Sipkins, X. Wei, J. W. Wu et al., Nature 435 (7044), 969 (2005). M. Ogawa, Y. Matsuzaki, S. Nishikawa et al., J Exp Med 174 (1), 63 (1991). We thank Shinichi Nishikawa for discussions and A. Roth and C. Raithel for technical assistance. This work was in part financed by the Deutsche Forschungsgemeinschaft. Figure 1: Test for correct epitope binding by ‘live in culture’ antibody staining. Living cells were stained in living cell cultures containing different concentrations of PE-conjugated anti-CD19 AB at 37°C over night. Cells were then harvested and co-stained with a Alexa647-conjugated anti-CD19 AB (same clone) at 2000 ng / ml, and under well established conditions used for FACS staining (30 minutes on ice, in the presence of fetal calf serum and azide). Binding of both ABs was detected by FACS analysis on a FACSAria (Becton Dickinson) using standard procedures. Blocked binding of the second (Alexa647-conjugated) applied AB demonstrates binding of the first (PE-conjugated) AB to the same epitope. Source: Protocol Exchange (2011) doi:10.1038/protex.2011.205. Originally published online 28 January 2011.